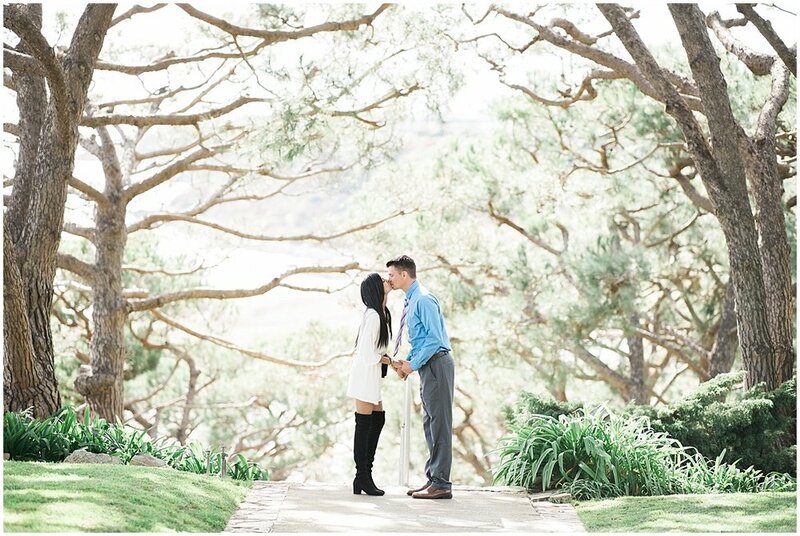 I photographed the most beautiful and emotional proposal in Palos Verdes at Wayfarers Chapel. I just met Chase and J but tears were rushing down my face. The proposal was flawless, J thought we were just doing a normal / fun shoot but little did he know he would pop the question on the last day of their vacation. About us: Odds were not in our favor from the beginning of our relationship. We live 400 miles apart and I work out of town 215 days/year. Yeah, ouch. But, somehow we made it work. We probably logged 1,000 hours of Facetime and we flew to see each other as often as possible. We are foodies for sure…really appreciate a nice dinner & cheap wines, and Jeielma is a great cook herself! (Lucky me). We love to travel together, especially to the beaches. I knew about the proposal location and that capturing the moment was very important to both of us. Jei also likes to take photos which I shy away from. I thought it would be a welcomed surprise to have a professional photographer meet us at a beautiful setting and then add one more special surprise. Nervous? Yes, to say the least. But I was confident and happy throughout the entire process.